A short account of the "soccer war" between El Salvador and Honduras which was sparked by rioting during the second North American qualifying round for the 1970 World Cup. Luis ... had read a report on the soccer match between the Honduran and Salvadoran national teams. The two countries were playing for the right to take part in the 1970 World Cup in Mexico. The first match was held on Sunday 8 June 1969, in the Honduran capital, Tegucigalpa. Nobody in the world paid any attention. The Salvadoran team arrived in Tegucigalpa on Saturday and spent a sleepless night in their hotel. The team could not sleep because it was the target of psychological warfare waged by the Honduran fans. A swarm of people encircled the hotel. The crowd threw stones at the windows and beat sheets of tin and empty barrels with sticks. They set off one set of firecrackers after another. They leaned on the horn of cars parked in front of the hotel. The fans whistled, screamed and sent up hostile chants. This went on all night. The idea was that a sleepy, edgy, exhausted team would be bound to lose. In Latin America these are common practices. The next day Honduras defeated the sleepless El Salvador squad one-nil. Eighteen-year-old Amelia Bolanios was sitting in front of the television in El Salvador when the Honduran striker Roberto Cardona scored the winning goal in the final minute. She got up and ran to the desk which contained her father’s pistol in a drawer. She then shot herself in the heart. ‘The young girl could not bear to see her fatherland brought to its knees,’ wrote the Salvadoran newspaper El Nacional the next day. The whole capital took part in the televised funeral of Amelia Bolanios. An army honour guard marched with a flag at the head of the procession. The president of the republic and his ministers walked behind the flag-draped coffin. Behind the government came the Salvadoran soccer eleven who, booed, laughed at, and spat on at the Tegucigalpa airport, had returned to El Salvador on a special flight that morning. But the return match of the series took place in San Salvador, the beautifully named Flor Blanca stadium, a week later. This time it was the Honduran team that spent a sleepless night. The screaming crowd of fans broke all the windows in the hotel and threw rotten eggs, dead rats and stinking rags inside. The players were taken to the match in armoured cars of the First Salvadoran Mechanized Division - which saved them from revenge and bloodshed at the hands of the mob that lined the route, holding up portraits of the national heroine Amelia Bolanios. The army surrounded the ground. On the pitch stood a cordon of soldiers from a crack regiment of the Guardia Nacional, armed with sub-machine-guns. During the playing of the Honduran national anthem the crowd roared and whistled. Next, instead of the Honduran flag—which had been burnt before the eyes of the spectators, driving them mad with joy—the hosts ran a dirty, tattered dishrag up the flag-pole. Under such conditions the players from Tegucigalpa did not, understandably, have their minds on the game. They had their minds on getting out alive. ‘We’re awfully lucky that we lost,’ said the visiting coach, Mario Griffin, with relief. The same armoured cars carried the Honduran team straight from the playing field to the airport. A worse fate awaited the visiting fans. Kicked and beaten, they fled towards the border. Two of them died. Scores landed in hospital. One hundred and fifty of the visitors’ cars were burned. The border between the two states was closed a few hours later. Luis read about all of this in the newspaper and said that there was going to be a war. He had been a reporter for a long time and he knew his beat. 'Whenever the ball flew towards our goal and a score seemed inevitable, Jesus reached his foot out of the clouds and cleared the ball.’ Drawings accompanied the article, illustrating the supernatural intervention. ‘Do you think it’s worth going to Honduras?’ I asked Luis, who was then editing the serious and influential weekly Siempre. I was in Tegucigalpa the next morning. At dusk a plane flew over Tegucigalpa and dropped a bomb. Everybody heard it. The nearby mountains echoed its violent blast so that some said later that a whole series of bombs had been dropped. Panic swept the city. People fled home; merchants closed their shops. Cars were abandoned in the middle of the street. A woman ran along the pavement, crying, ‘My child! My child!’ Then silence fell and everything became still. It was as if the city had died. The lights went out and Tegucigalpa sank into darkness. I hurried to the hotel, burst into my room, fed a piece of paper into the typewriter and tried to write a dispatch to Warsaw. I was trying to move fast because I knew that at that moment I was the only foreign correspondent there and that I could be the first to inform the world about the outbreak of the war in Central America. But it was pitch dark in the room and I couldn’t see anything. I felt my way downstairs to the reception desk, where I was lent a candle. I went back upstairs, lit the candle and turned on my transistor radio. The announcer was reading a communiqué from the Honduran government about the commencement of hostilities with El Salvador. Then came the news that the Salvadoran army was attacking Honduras all along the front line. At this moment someone in the Street started shouting "Apaga la luz!’ (‘Turn off the light!’) over and over, more and more loudly with increasing agitation. I blew out the candle. I went on typing blind, by touch, striking a match over the keys every now and then. Since early morning people had been digging trenches, erecting barricades - preparing for a siege. Women were stocking up supplies and criss-crossing their windows with masking tape. People rushed through the streets directionless; an atmosphere of panic reigned. Student brigades were painting outsized slogans on walls and fences. A bubble full of graffiti had burst over Tegucigalpa, covering the walls with thousands of verses. Latins are obsessed with spies, intelligence conspiracies and plots. In war, everyone is a fifth-columnist. I was not in a particularly comfortable situation: official propaganda on both sides blamed communists for every misfortune, and I was the only correspondent in the region from a socialist country. Even so, I wanted to see the war through to the end. I went to the post office and asked the telex operator to join me for a beer. He was terrified, because, although he had a Honduran father, his mother was a citizen of El Salvador. He was a mixed national and thus among the suspects. He did not know what would happen next. All morning the police had been herding Salvadorans into provisional camps, most often set up in stadiums. Throughout Latin America, stadiums play a double role: in peacetime they are sports venues; in war they turn into concentration camps. By the afternoon the other correspondents arrived from Mexico, forty of them, my colleagues. They had flown into Guatemala and then hired a bus, because the airport in Tegucigalpa was closed. They all wanted to drive to the front. We went to the Presidential Palace, an ugly, bright blue turn-of-the-century building in the centre of the town to arrange permission. There were machine-gun nests and sandbags around the palace, and anti-aircraft guns in the courtyard. In the corridors inside, soldiers were dozing or lolling around in full battledress. People have been making war for thousands of years, but each time it is as if it is the first war ever waged, as if everyone has started from scratch. A captain appeared and said he was the army press spokesman. He was asked to describe the situation and he stated that they were winning all along the front and that the enemy was suffering heavy casualties. The Americans, the captain explained, were already there. They always go first because of their influence - and because they commanded obedience and could arrange all sorts of things. The captain said we could go the next day, and that everyone should bring two photographs. We drove to a place where two artillery pieces stood under some trees. Cannons were firing and stacks of ord­nance were lying around. Ahead of us we could see the road that led to El Salvador. Swamp stretched along both sides of the road, and dense green bush began past the belt of swamp. The sweaty, unshaven major charged with holding the mad said we could go no further. Beyond this point both armies were in action, and it was hard to tell who was who or what belonged to which side. The bush was too thick to see anything. Two opposing units often noticed each other only at the last moment, when, wandering through the overgrowth, they met face to face. In addition, since both armies wore the same uniforms, carried the same equipment, and spoke the same language, it was difficult to distinguish friend from foe. The major advised us to return to Tegucigalpa, because advancing might mean getting killed without even knowing who had done it. (As if that mattered, I thought.) But the television cameramen said they had to push forward, to the front line, to film soldiers in action, firing, dying. Gregor Straub of NBC said he had to have a close-up of a soldiery's face dripping sweat. Rodolfo Carillo of CBS said he had to catch a despondent commander sitting under a bush and weeping because he had lost his whole unit. 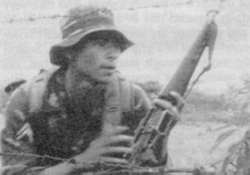 A French cameraman wanted a panorama shot with a Salvadoran unit charging a Honduran unit from one side, or vice versa. Somebody else wanted to capture the image of a soldier carrying his dead comrade. The radio reporters sided with the cameramen. One wanted to record the cries of a casualty summoning help, growing weaker and weaker, until he breathed his last breath. Charles Meadows of Radio Canada wanted the voice of a soldier cursing war amid a hellish racket of gunfire. Naotake Mochida of Radio Japan wanted the bark of an officer shouting to his commander over the roar of artillery - using a Japanese field telephone. The soccer war lasted one hundred hours. Its victims: 6,000 dead, more than 12,000 wounded. Fifty thousand people lost their homes and fields. Many villages were destroyed. The two countries ceased military action because Latin American states intervened, but to this day there are exchanges of gunfire along the Honduras - El Salvador border, and people die, and villages are burned. These are the real reasons for the war: El Salvador, the smallest country in Central America, has the greatest population density in the western hemisphere (over 160 people per square kilometre). Things are crowded, and all the more so because most of the land is in the hands of fourteen great landowning clans. People even say that El Salvador is the property of fourteen families. A thousand latjfundistas own exactly ten times as much land as their hundred thousand peasants. Two-thirds of the village population owns no land. For years a part of the landless poor has been emigrating to Honduras, where there are large tracts of unimproved land. Honduras (12,000 square kilometres) is almost six times as large as El Salvador, but has about half as many people (2,500,000). This was illegal emigration but was kept hushed-up, tolerated by the Honduran government for years. Salvadoran peasants settled in Honduras, established villages, and grew accustomed to a better life than the one they had left behind. They numbered about 300,000. In the l960s, unrest began among the Honduran peasantry, which was demanding land, and the Honduras government passed a decree on agricultural reform. But since this was an oligarchical government, dependent on the United States, the decree did not break up the land of either the oligarchy or the large banana plantations belonging to the United Fruit Company. The government wanted to re-distribute the land occupied by the Salvadoran squatters, meaning that the 300,000 Salvadorans would have to return to their own country, where they had nothing, and where, in any event, they would be refused by the Salvadoran government, fearing a peasant revolution. Relations between the two countries were tense. News­ on both sides waged a campaign of hate, slander calling each other Nazis, dwarfs, drunkards, sadists, spiders, aggressors and thieves. There were pogroms. Shops were burned. In these circumstances the match between Honduras and El Salvador had taken place. The war ended in a stalemate. The border remained the same. It is a border established by sight in the bush, in mountainous terrain that both sides claim. Some of the émigrés returned to El Salvador and some of them are still living in Honduras. And both governments are satisfied: for several days Honduras and El Salvador occupied the front pages of the world press and were the object of interest and concern. The only chance small countries from the Third World have of evoking a lively international interest is when they decide to shed blood. This is a sad truth, but so it is. The deciding game of the best-of-three series was held on neutral ground, in Mexico (El Salvador won, three-two). The Honduran fans were placed on one side of the stadium, the Salvadoran fans on the other side, and down the middle sat 5,000 Mexican police armed with thick clubs. If you have access to JSTOR, Vincent Cable's contemporary article 'The 'Football War' and the Central American Common Market' in the journal International Affairs also touches on the more significant/ long-term factors explaining why the war broke out.